This distinctive button necklace is rich with an assortment of red, black and white buttons. These are threaded onto jewellery wire, which secures at the end with a silver plated lobster clasp fastener. This distinctive button bracelet is rich with an assortment of green, red and lime buttons and also features one strawberry button. This distinctive button necklace is rich with an assortment of red, white, lime green and yellow buttons. It also features one ladybird and one daisy button. This distinctive button necklace is rich with an assortment of lime green and grey buttons. This distinctive button necklace is rich with an assortment of yellow, black and white buttons. 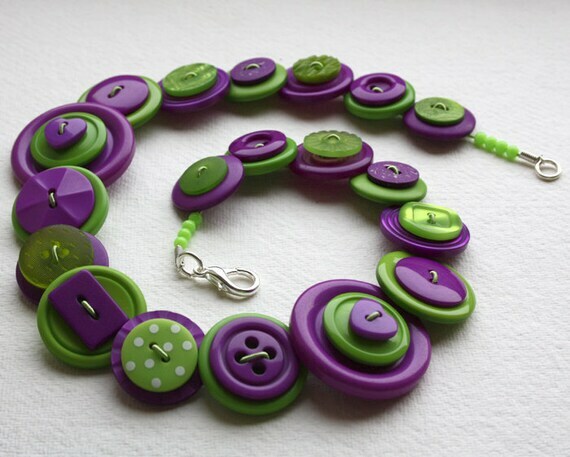 This distinctive button necklace is rich with an assortment of purple and green buttons. 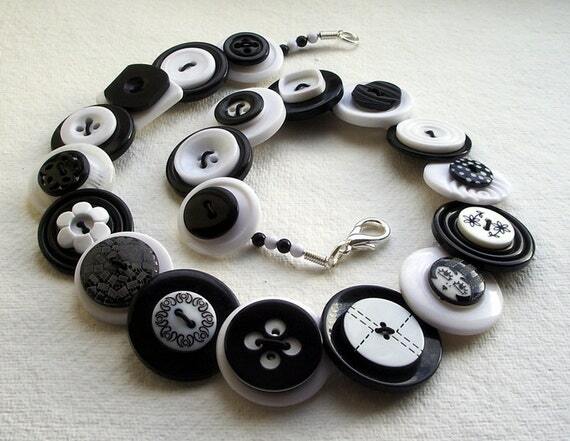 This distinctive button necklace is rich with an assortment of black and white buttons. This distinctive button necklace is rich with an assortment of red and white buttons. 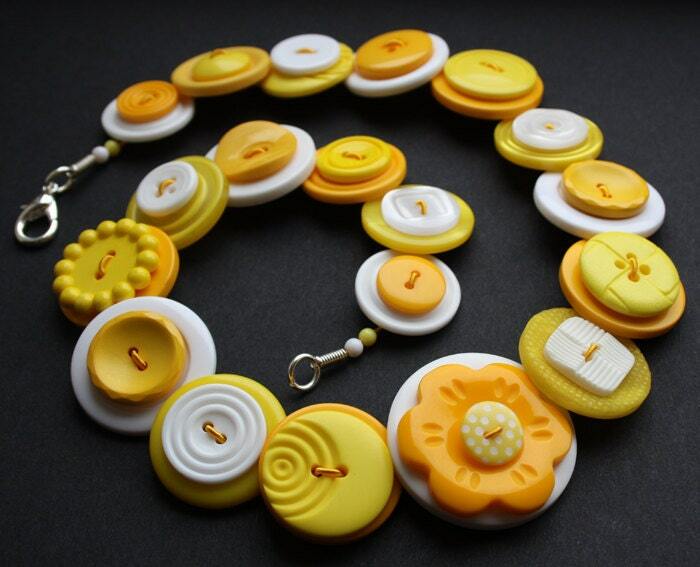 This distinctive button necklace is rich with an assortment of golden yellow, lemon and white buttons. Folksy :: Buy "Sunflowers - Golden Yellow, Brown and Lime button necklace"
This distinctive button necklace is rich with an assortment of golden yellow, brown and lime buttons, plus three sunflower buttons centrally positioned. 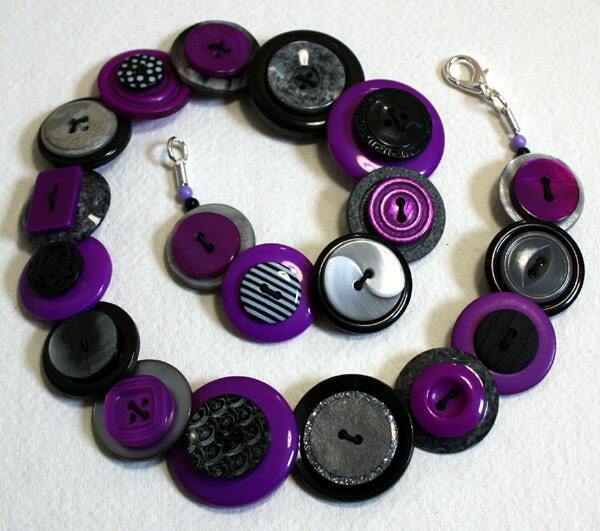 This distinctive button necklace is rich with an assortment of purple, black and grey buttons. These are threaded onto jewellery wire, which secures at the end with a silver plated lobster clasp fastener. 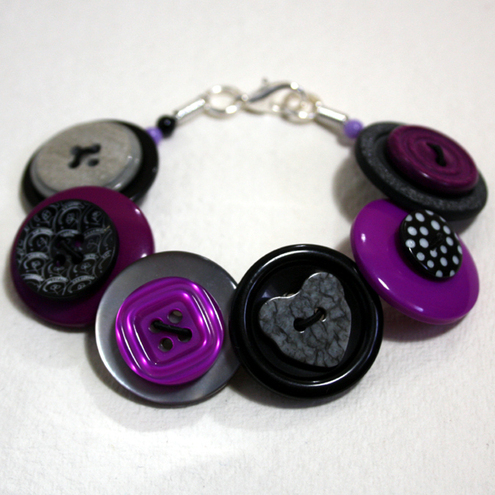 Folksy :: Buy "Purple, Black and Grey/Gray button bracelet FREE UK SHIPPING"
This distinctive button bracelet is rich with an assortment of purple, black and grey coloured buttons.